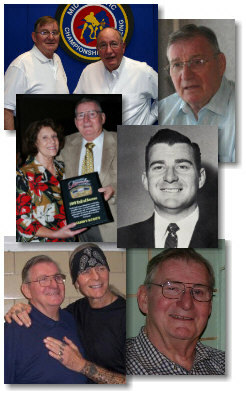 Sandy Scott passed away on Thursday March 11, 2010 after a tough fight with pancreatic cancer. The Mid-Atlantic Gateway sends its heartfelt condolences to the family and friends of Sandy Scott. Gateway Promo Ad for 4/10/10 tribute show. 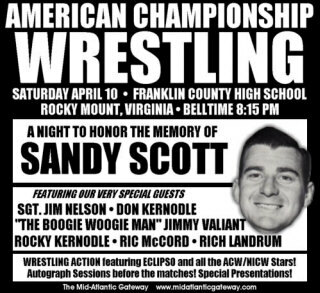 In the last couple of years before his death, Sandy Scott was involved with ACW Wrestling in Rocky Mount VA, helping out behind the scenes creatively and also acting as their "trouble shooter", a role in which he also served in Jim Crockett's Mid-Atlantic Championship Wrestling and Ted Turner's World Championship Wrestling decades earlier. 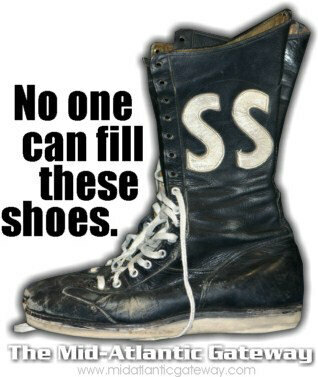 Eclipso and all the stars of ACW, along with stars from the NICW and BWC, honored the memory of Sandy at their monthly show in Rocky Mount on 4/10/10. Sandy's wife Sandra, daughter Tracy, and grandson Coleton were in attendance and were recognized.